Main content for "Category: Open Access"
This presentation introduces attendees to Virginia Tech’s new open textbook “Fundamentals of Business,” the process of adapting an existing openly licensed text, helpful tools developed or discovered since, and lessons learned — including the University Libraries’ evolving processes for supporting faculty authoring of openly licensed textbooks and other learning resources. 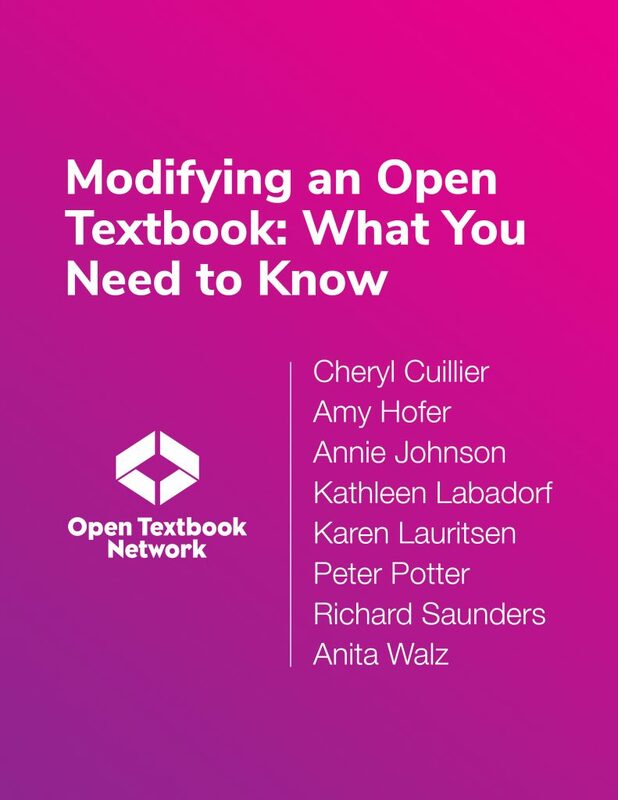 Modifying an Open Textbook: What you Need to Know by Cheryl Cuillier, Amy Hofer, Annie Johnson, Kathleen Labadorf, Karen Lauritsen, Peter Potter, Richard Saunders, and Anita Walz. Part of the Open Textbook Network. Authoring Open Textbooks by Melissa Falldin and Karen Lauritsen. Part of the Open Textbook Network. 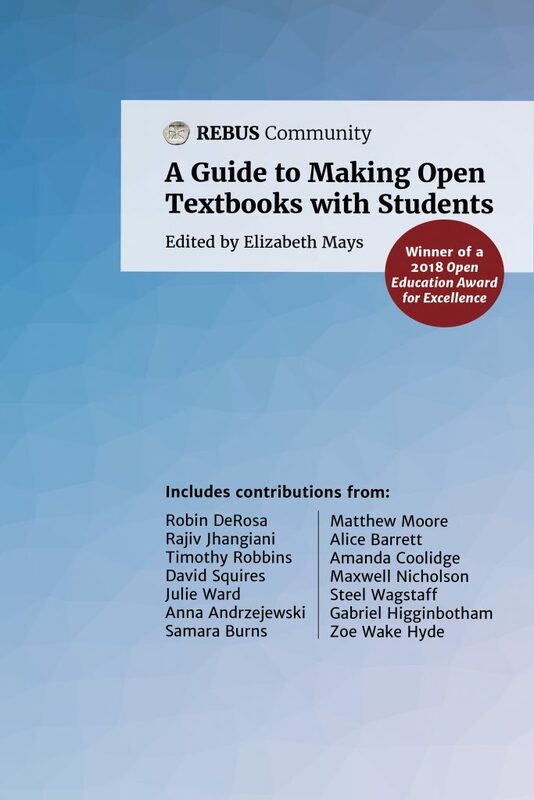 A Guide to Making Open Textbooks with Students. Created by the Rebus Community. Edited by Elizabeth Mays with contributions from Robin DeRosa, Rajiv Jhangiani, Timothy Robbins, David Squires, Julie Ward, Anna Andrzejewski, Samara Burns, Matthew Moore, Alice Barrett, Amanda Coolidge, Maxwell Nicholson, Steel Wagstaff, Gabriel Higginbotham, and Zoe Wake Hyde. Virginia Tech is one of nine founding members of the Open Textbook Network Publishing Cooperative, a pilot program focused on publishing new, openly licensed textbooks. The program was launched by the Open Textbook Network (OTN) and aims to increase open textbook publishing experience in higher education institutions by training a designated project manager at each institution and creating a network of institutions. The Cooperative is a three-year pilot that will establish publishing workflow and processes to expand the development of open textbook publishing in higher education. As a member, Virginia Tech’s project managers, Corinne Guimont (Digital Publishing Specialist) and Anita Walz (Open Education, Copyright and Scholarly Communications Librarian), will gain expertise in project management and technical skills. After the training is complete, a minimum of three open textbooks will be published using the model and tools gained through the cooperative. Virginia Tech’s involvement in the Publishing Cooperative builds upon previous open textbooks published in the library, including Fundamentals of Business by Stephen J. Skripak and a newly released Beta Version of Electromagnetics by Steven W. Ellingson. At the completion of the three-year pilot, the Publishing Cooperative as a whole will publish at least two dozen new, freely available, textbooks with Creative Commons Attribution (CC BY) licenses. If you are Virginia Tech Faculty and interested in publishing an open textbook or other educational resources with Virginia Tech please visit http://guides.lib.vt.edu/oer/grants. Founding members of the OTN Publishing Cooperative include: Miami University, Penn State University, Portland State University, Southern Utah University, University of Cincinnati, University of Connecticut, University of North Carolina at Greensboro, Virginia Tech, and West Hills Community College District (CA). About the Open Textbook Network: The Open Textbook Network (OTN) is a community working to improve education through open education, with members representing over 600 higher education institutions. OTN institutions have saved students more than $8.5 million by implementing open education programs, and empowered faculty with the flexibility to customize course content to meet students’ learning needs. This is an invitation to librarians, particularly those engaged in publishing, to explore current standards and practices, clear communication to non-librarians, and to prompt us to reflect about and discuss our values as libraries supporting access and creation of scholarly and learning resources.